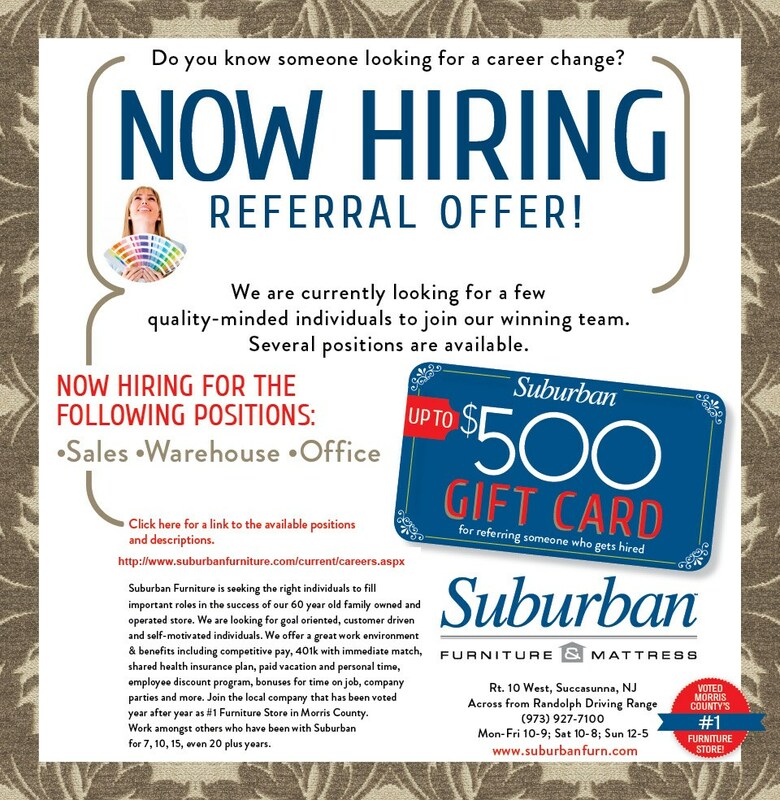 Suburban Furniture, one of New Jersey’s leading and fastest growing independent furniture retailers, is adding to our highly professional, customer driven staff to assist us with our continued growth. We are searching for mature, competitive professionals with excellent communication skills and a desire to learn. If you have experience in retail sales, home furnishings, design, auto sales or have a strong desire to help others make difficult decisions, we want to talk to you. Suburban Furniture is an extraordinary environment for serious sales professionals. Suburban Furniture is family owned for over 60 years. We provide the additional training and the environment in which sales professionals can achieve their goals. $500 gift card rules: thanks for referring a qualified friend or family to our organization. If we hire your referral we will send you a Suburban gift card for $250. If your referral is still employed after 90 days from their start date we will send you another $250 Suburban gift card. Please make sure your referral mentions you when they are hired. Thanks again!